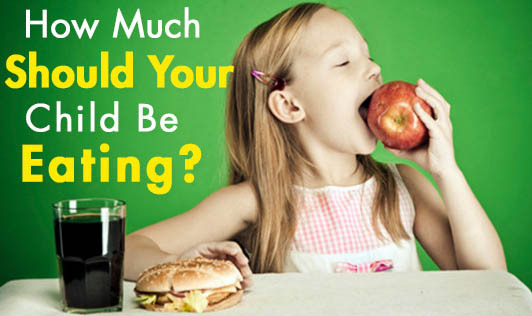 How Much Should Your Child Be Eating? Read below to get a rough idea about a child's intake. Do not worry if he eats more/less than the quantities specified, as the intake varies with every baby. 0-4 months- Try not to start solid foods too early as babies need exclusive breastfeeding/ formula milk (if breast milk is insufficient) until the 6th month. Between 6 months and a year, breast feeding is still a very important diet for your baby. So keep up the supply! 4-6 months- In addition to breast milk, pureed vegetables/fruits can be started. Begin with 1 tablespoon per day to 1 tablespoon twice a day along with the breastfeed. 6-8 months- In addition to the breast milk, pureed fruits, pureed vegetables, pureed legumes, and powdered cereals can be included. Begin with 3 to 9 tablespoons of cereal, in 2 to 3 feedings along with 2 to 3 feedings of fruits/vegetables. 8-10months- Breast milk along with mashed fruits, mashed vegetables, cooked and mashed legumes, well cooked cereals, small amounts of milk products like curd (no cow's milk until 1 year age) can be given. You can start with 1/4th cup, and gradually increase it to ½ cup a day depending on the baby's tolerance. 10-12 months- Breast milk and fruits, vegetables, cooked legumes, cooked cereals, milk products have to be included. The quantity can be increased from ½ cup to 3/4th cup and then a cup/day spread as 2-3 feedings. • If your baby doesn't eat a new food on the first try, offer it again after a few days. • Introduce new foods one at a time, with at least three days in between to make sure your baby's not allergic and feed in small quantities.